Biblical studies, biblical archaeology, biblical criticism, biblical authorship, biblical history. In the first volume of his extensive study, A History of the Jews and Judaism in the Second Temple Period, Grabbe comments that a number of peculiar problems confront the would-be historian in attempting to write about the Persian period. Among these are the survival of few primary (contemporary) documents, the types of extant written sources, large gaps in the available sources, and the fact that most narrative descriptions written about this era in antiquity are late works in Greek or Latin, presenting events from a Hellenic or Roman perspective. When he later turns to discussing the history of one of Judah’s neighbors, Samaria, during the Achaemenid era, Grabbe describes our present knowledge as “skimpy.” One might add that scholarly reconstructions have been hampered by an over-reliance on late Judean biblical texts, most of which are polemical in tone, and the testimony of Josephus. Happily, as Grabbe himself notes, recent discoveries have begun to change this picture. The publication of the Samaria papyri and seal impressions, the publication and analysis of hundreds of Samarian coins, and the partial publication of the Mt. Gerizim excavations have enhanced our knowledge and complicated older reconstructions of the religious history of the region of Samaria during the Achaemenid and Hellenistic eras. My essay deals with some aspects of Samaria’s religious culture as reflected in the hundreds of short (fragmentary) inscriptions from Mt. Gerizim written in Lapidary Aramaic, the so-called Proto-Jewish script, and the Neo-Hebrew script. The Mt. Gerizim inscriptions written in the Samaritan script may be left out of this discussion as these texts date to the late antique and medieval periods. Given space constraints, my study will focus on the composition of proper names within the available epigraphic sources. At the outset, some caution must be exercised in dealing with onomastic evidence so as not to draw far-reaching and detailed conclusions about the history and culture of a particular area. There are limits to how much information about ethnicity or religious affiliation can be derived from the make-up of proper names. To take one example, the element baal can function in a proper name as a theonym or as an appellative. In the former case, the term can refer to a particular deity, the Canaanite god Haddad or Haddu; but, in the latter case, baal can function as an epithet for a variety of ancient Near Eastern deities, including Yahweh. To take a second example, in dealing with the onomastic evidence stemming from the Neo-Babylonian, Achaemenid, and Hellenistic periods, one has to account for the phenomenon of double (or second) names. Double names are cases in which a person may carry a second name with no relationship to that person’s own ethnic background. The use of double names may be subject to several different explanations within the larger international context of various ethnic groups coexisting during the post-monarchic era. But, in any case, the very phenomenon of second names augurs against assuming that those bearing foreign names had somehow abandoned their traditional gods or ethnic backgrounds. In short, the linguistic and religious features of personal names may be used in some cases to provide some indication of their bearers’ identities, but one must be careful to recognize the limitations of the evidence available to us. If the names appear with patronyms, affiliations, titles, or place-names, that information may be very useful as a control in contextualizing the possible significance of such anthroponyms. In any case, one has to deal with the evidence that is available to us, recognizing its limitations and cultural contexts. Some issues of script nomenclature: what Cross and others have called the paleo-Hebrew script, the imitation (or continuation) of the old Hebrew script, Magen, Misgav, and Tsfania call the Neo-Hebrew script. What Cross and others have called Proto-Hasmonean script, the Mt. Gerizim epigraphers call Proto-Jewish. For the sake of the convenience of readers, I will follow the nomenclature used in the Mt. Gerizim publications. The so-called Proto-Jewish (a.k.a. Proto-Hasmonean) script was once thought to be a distinctive local development from the standard Aramaic cursive of the late Persian empire. But, given the appearance of the same script in the Mt. Gerizim inscriptions, the script should be renamed. Indeed, the question may be raised whether this script is unique to Yehud and Samaria. In looking at the composition of Samarian proper names in the Hellenistic period, the recently published inscriptions discovered at Mt. Gerizim are of considerable help. The approximately 400 fragmentary inscriptions unearthed over the course of the recent excavations on Mt. Gerizim represent a most welcome epigraphic discovery. The inscriptions are written in Lapidary Aramaic, Proto-Jewish, Neo-Hebrew, and Samaritan scripts. The discovery of a large number of inscriptions in the so-called Proto-Jewish script is especially notable. Most of the inscriptions from Mt. Gerizim are dated to the third and second centuries B.C.E. Unfortunately, most of the inscriptions, whatever their exact dates, were not found in situ, but were found scattered in various areas around the site. Almost all of the inscriptions are of a votive or dedicatory character. It should be noted that many of the texts written in Aramaic script and Neo-Hebrew script were discovered in and around the area of the sacred precinct. Magen, Misgav, and Tsfania hypothesize that the votives were inscribed on already extant stones embedded in walls surrounding or leading up to the temple. After the temple was destroyed, many of the stones upon which the votive texts were inscribed were reused in later building phases. In what follows, I wish to discuss not only certain aspects of the inscriptions written in Lapidary Aramaic, but also some of the Proto-Jewish and Neo-Hebrew inscriptions. It must be remembered that although these texts date to the Hellenistic era, they provide a glimpse into the longue durée of the Mt. Gerizim site. They either presuppose the existence of a Yahwistic temple or make explicit references to this shrine. As such, the inscriptions may provide us with insight into the character of the developing Samarian community and its reception of the Mt. Gerizim sanctuary. Since epigraphic evidence from this general area dating to the third and second centuries is not abundant, the texts provide welcome light on an obscure era. It may be appropriate to begin with a very brief discussion of some personal names among the inscriptions before we move on to discuss inscriptions involving the temple and its religious affairs. As is the case with the Samaria papyri and the Samarian numismatic remains, one finds a variety of personal names of a Yahwistic character, such as Delaiah, Hananiah and/or Honiah, Jehonathan, Jehoseph, Joseph, Shemaiah, as well as common names, such as Elnatan, Ephraim, Zabdi, Haggai, Jacob, and Simeon. Less common names include Abishag and Shobai. In a northern context, it is not surprising to find personal names such as Ephraim, Jacob, and Joseph. Yet, one also finds “Yehud” and “Judah” among the anthroponyms at Mt. Gerizim. If there was a long history of intense rivalry and ongoing enmity between the Jerusalem and Mt. Gerizim communities, it would be less likely that one would find individuals named Judah and Yehud making dedications at the Mt. Gerizim shrine. Also of interest is the threefold occurrence of the personal name Miriam among the Mt. Gerizim inscriptions. In the Hebrew scriptures, the name occurs prominently as the nomenclature for the sister of Moses, one of the leaders of the exodus generation (Exod 15:20; Num 12:1–15; 20:1; 26:59; Deut 24:9; Mic 6:4; 1 Chr 5:29). The name appears only once elsewhere, as the proper name of a descendant of Judah (1 Chr 4:17). The name is thus far unattested, to my knowledge, on any Israelite or Judahite inscriptions, seals, or bullas. On two of the Mt. Gerizim inscriptions, Miriam appears as the name of a donor. In one case, an inscription written in Lapidary Aramaic script, a certain Miriam makes an unspecified offering on behalf of herself and on behalf of her sons. In another case, Miriam appears as one of a number of benefactors (Lapidary Aramaic script). In the third case, an inscription in Proto-Jewish script, the context is too fragmentary to reach any larger conclusions. Miriam is thus only one of several names found among the Mt. Gerizim inscriptions that are reminiscent of the appellatives given to prominent figures in the people’s classical past. Some recall the time of the Ancestors (e.g. Jacob, Joseph, Ephraim, Judah, Levi), while others recall major figures associated with the times of Exodus, Sinai, and the emergence in the land (e.g. Amram, Eleazar, Miriam, Phinehas). As with the names found among the Samaria papyri, there are some foreign names in the Mt. Gerizim inscriptions, for example, “Bagohi” (Lapidary Aramaic). Interestingly, but not too surprisingly given the long history of the Mt. Gerizim sacred precinct in the Persian, Hellenistic, Roman, and Byzantine eras, about one-fifth of the total proper names attested are Greek names. In summary, when surveying the Mt. Gerizim onomasticon with the early Hellenistic period in view, one is struck by three things: (1) the number of common Yahwistic proper names; (2) the number of archaizing personal names, that is, names that recall the names of male and female figures associated with Israel’s ancient past; and (3) the number of common Hebrew names. The names found in the Mt. Gerizim inscriptions may be approached from another vantage point. It may be useful to pay some attention to the relevance of the inscriptions for our understanding of the sanctuary and its religious context. To begin with one inscription written in Lapidary Aramaic mentions “bulls in all…sacrificed in the house of sacrifice.” The reference to a “house of sacrifice” is especially intriguing, because the same expression (in Hebrew) is used by the deity in the book of Chronicles to refer to his election of the temple in Jerusalem (2 Chr 7:12). Other inscriptions contain formulae, such as “before God/the Lord in this place,” or simply “before God” or “before the Lord”. Based on biblical and extra-biblical parallels, such phraseology almost always suggests the context of a sacred precinct. 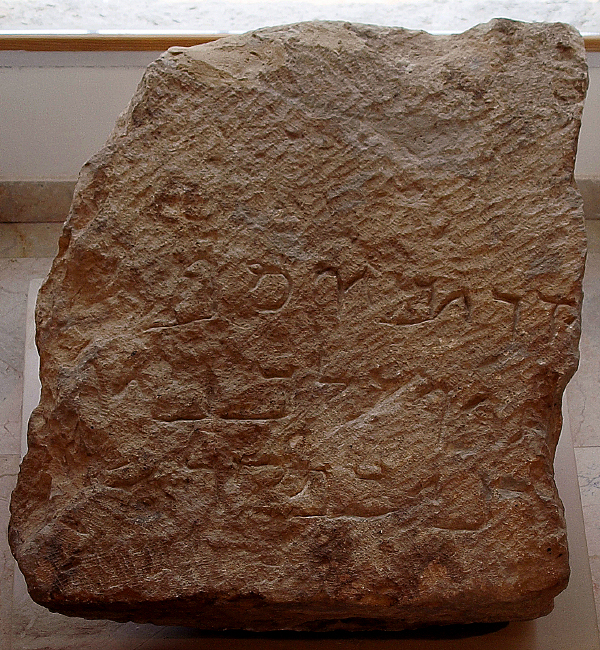 Inscription "that which Joseph son of… offered for his wife and for his sons before the Lord in the temple"
One of the inscriptions written in paleo-Hebrew (or Neo-Hebrew) script contains the Tetragrammaton, apparently as part of the phrase “the house of Yhwh”. The use of the Tetragrammaton is, however, relatively rare and is not found among the extant Proto-Jewish inscriptions. The common terms for the divine are “God” (elaha) and “the Lord” (adonai). For example, an inscription in Proto-Jewish script reads, in part, “that which Joseph son of… offered for his wife and for his sons before the Lord in the temple”. Some inscriptions contain the titles of a priest or priests, who served as religious specialists at the Mt. Gerizim shrine. One should mention, in this context, the appearance of some Levitical and priestly names found in the Mt. Gerizim inscriptions, such as Levi, a personal name that is found on two different inscriptions. It should be pointed out, however, that unlike the situation with the references to the priests as a group, there are no attested references to the Levites as a group. Among the priestly names attested in the Mt. Gerizim inscriptions are Amram, the name of the father of Moses in biblical tradition (Exod 6:18, 20; Num 3:19; 26:58; 1 Chr 5:28; 6:3; 23:12; 24:20; cf. Ezra 10:34; Proto-Jewish script) and Eleazar, the name of the son of Aaron (Exod 6:23; Josh 24:33; Judg 20:28; Ezra 7:5; 1 Chr 5:29; 6:35; 24:1–6). 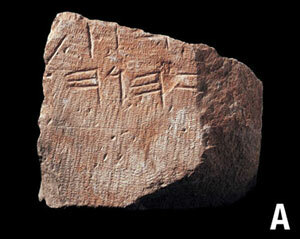 The name Eleazar is found on two separate inscriptions, as well as on one square-shaped object, possibly a late seal. 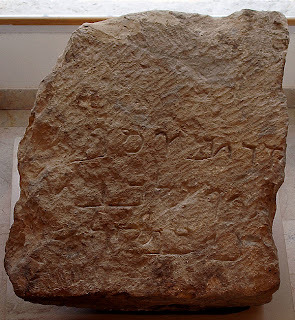 Another common priestly name found among the inscriptions is Phinehas, the son of Eleazar in biblical tradition (Exod 6:25; Num 25:7, 11; 31:6; Josh 22:13, 30–32; 24:33; Judg 20:28; Ps 106:30; Ezra 7:5; 8:2; 1 Chr 5:30; 6:35; 9:20; 24:1; Sir 45:23; 50:24). The name Phinehas is found on five different inscriptions. The repeated appearance of the name in Neo-Hebrew (or paleo-Hebrew) script may be important insofar as this script seems to have been favored (although not exclusively so) in some sacerdotal dedications. Iscription "son of Phinehas the prist"
My argument is that not all of these figures with traditional Levitical and priestly names actually served as cultic functionaries or priests at Mt. Gerizim. The fragmentary evidence does not permit such a sweeping conclusion. Nevertheless, a few of the inscriptions do mention such sacerdotal personnel, along with their personal names, as the source of the relevant dedications. In other words, it is clear that priests were among those who made dedications at the shrine. It is also interesting that many of these priestly names replicate priestly names associated with Israel’s ancient past. Perhaps some of the other dedicatory inscriptions included additional priestly names along with priestly titles, but the evidence is too partial to know for sure. In their studies of the epigraphic remains from northern Israel, both Lemaire and Zadok observe that the percentage of Yahwistic names attested from the fifth and fourth centuries in epigraphic sources (Samaria papyri, Samarian coins) is much higher than the percentage of Yahwistic names attested from the ninth-eighth centuries in epigraphic sources (the Samaria ostraca and various seal impressions). It might be tempting to draw similar contrasts between the fifth and fourth centuries and the third and second centuries. Based on such a broad comparison, one could leap to the conclusion that the Samarian community became more conservative during the Hellenistic era. Such a conclusion about a major onomastic shift would be potentially misleading, however. The names available from the Persian period derive from commercial, administrative, and political contexts, whereas the names available from the Hellenistic period largely derive from a cultic setting at a different geographic location. It is not surprising that a good number of the appellations in the Mt. Gerizim inscriptions are priestly or Levitical in nature, whereas such appellations are rare, if non-existent, among the Samaria papyri and the Samarian coins. If one examines, for the sake of comparison, the anthroponyms found within the lists in Ezra–Nehemiah, one discovers that the lists of priests and Levites contain more Yahwistic names than those pertaining to other groups. Similarly, the fact that the Samarian coins and papyri contain a fair number of Persian and Babylonian names is understandable, given the nature of the documentation and the larger imperial, diplomatic, and commercial setting within which the capital of Samaria functioned. Indeed, one cannot presume that all of the names in the Samaria papyri (mostly slave sales and slave dockets) are those of Samarians. Similarly, some allowance has to be made, for example, for the appearance of regional satraps on Samarian coins. One has to situate, as best one can, each onomasticon within its own particular geographic, social, and historical setting. It may be more prudent to maintain that the Mt. Gerizim inscriptions provide evidence of some continuity within the history of the Yahwistic community in Samaria. As in Judah, the elite was populated largely by Yahwists, but each of these communities had its own particular history and character. It hardly seems likely that Yahwism in Samaria was a late arrival or that Yahwistic Samarians were a late breakaway group from Judah. Similarly, it is not particularly helpful to view the Yahwists in Judah as completely dominated by or particularly beholden to the Yahwistic Samarians, even though Samaria appears to have been larger and more populous than was Yehud. Each of these provinces had its own particular cultic emphases and traits. Analysis of the proper names may bear this out. Certain names appearing in the Mt. Gerizim inscriptions are rare in Judean biblical literature, except as anthroponyms of traditional northern figures. The name of one of the dedicators in the Mt. Gerizim inscriptions, Ephraim, appears regularly in biblical literature as the son of the patriarch Joseph, the eponymous ancestor of the Ephraimites, the tribe bearing this appellation, the hill country associated with Ephraim, and a synonym of the northern kingdom itself. The association of Ephraim with the tribe of Ephraim or with northern Israel continues in the early Second Temple period (e.g. Zech 9:10, 11; 10:7; 1 Chr 9:3; 2 Chr 25:10; 28:7). But the name of Ephraim does not appear in the genealogies and lists of Chronicles, Ezra, and Nehemiah as the proper name of any individuals from Judah, Benjamin, or Levi. The name does not appear as a personal name, to my knowledge, in any Judean extra-biblical inscriptions dating to the Iron age, the Persian period, or the early Hellenistic period. Similar things may be said of the name Joseph. The name appears in biblical literature as the son of Jacob and Rachel, the name of a tribe, a synonym of northern Israel, and the name of the northern kingdom. But the name Joseph only rarely appears in exilic or postexilic Judean literature as the proper name of a layperson (Ezra 10:42) or a priest (Neh 12:14). The personal name does not appear, to my knowledge, in any Judean extra-biblical inscriptions dating to the Iron Age, the Persian period, and the early Hellenistic period. The situation is quite different with the Mt. Gerizim inscriptions. Within the Mt. Gerizim texts, the personal name Joseph, or more often Jehoseph, appears in six different contexts. Joseph becomes, however, a very common proper name both in Syro-Palestine and in the diaspora during late Hellenistic and Roman times. The situation is somewhat more complicated with another famous biblical figure, Jacob. This name also appears in the Mt. Gerizim inscriptions as one of two brothers, sons of Simeon, making an offering. In biblical literature, Jacob functions as a patriarchal name, a synonym for the people of Israel, and a synonym for northern Israel. There has been considerable discussion about the usage of this name, like that of Israel, in some prophetic passages to refer to some portion of the people as a whole or to some portion thereof. In some texts in Deutero- and Trito-Isaiah, the term may designate Judah or a particular group within Judah, such as the Babylonian deportees. In one passage in Lamentations (2:2), the phrase the “settlements of Jacob” parallels the “fortresses of the daughter of Judah.” Nevertheless, the new usage does not signal an unequivocal shift in meaning, because there are other passages in Second and Third Isaiah in which the name Jacob still relates to the people as a whole. Apart from its use to signal a patriarch or a collective ethnicity bearing his name, the appellation Jacob is used relatively infrequently in what is traditionally considered to be Persian- or early Hellenistic-period Judean literature. The name does not appear as a personal name in any of the lists and genealogies in Chronicles, Ezra, and Nehemiah, with one possible exception. The name Jacob seems to be unattested in extra-biblical Judean inscriptions dating to the Iron and Persian ages, including the Elephantine papyri. The name does appear, however, in the later Wadi Murabba‘at documents, the Masada ostraca, a variety of ossuaries, and a number of other Jewish texts. Indeed, during late Hellenistic and Roman times, Jacob becomes a common Judean proper name. In short, the appearance of certain personal names, such as Jeroboam, Ephraim, Jacob, and Joseph on inscriptions from Samaria does not seem to be accidental. The redeployment of such names suggests that at least some residents of Samaria identified with earlier figures in the history of northern Israel. The Samarians have often been viewed as a schismatic sect, but it must be recognized that the Samarians had their own particular historical traits and traditions. Approaching the Samarians as Judeans under a different name is too simplistic. Nevertheless, it must also be said that the evidence from the papyri, coins, and inscriptions suggests many lines of continuity between Samaria and Yehud in Persian and Hellenistic times. Even as some members in each community may have been emphasizing distinctions between the two groups, the material evidence indicates that the two adjacent provinces possessed many common traits. The overlap in Yahwistic names and in Hebrew names is particularly noteworthy. The reuse of traditional Levitical and priestly names, such as Levi, Amram, Phinehas, and Eleazar, demonstrates that the Samarians, like the Judeans, construed their identity, at least in part, by recourse to traditions about and figures drawn from Israel’s classical past. The avoidance of the use of the Tetragrammaton in the third-to-second century B.C.E. Mt. Gerizim dedicatory inscriptions, especially those written in the proto-Jewish script, is striking. The preference for the use of “God” (elaha) or the “Lord” (adonai) over the use of yahweh is important, because the same preference as a religious phenomenon to protect the sanctity of the personal name of the God of Israel occurs in the development of early Judaism. Such parallels between the two communities are all the more interesting, because other material evidence from the province of Samaria, limited though it is, points to an overlap in cultural tradition with Yehud during the late Persian and early Hellenistic periods. The epigraphic (onomastic) evidence from Mt. 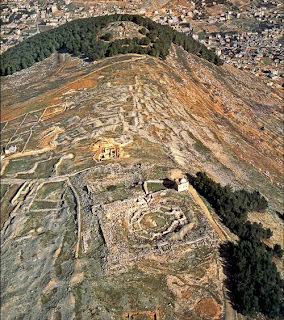 Gerizim, dating mostly to the third and second centuries B.C.E., shows that the religious overlap between the Samarians and the Judeans was as strong, if not stronger, in the Hellenistic period as it was in the Persian period. From the vantage point of the material remains, there is no clear indication that the two communities were moving in two opposite directions or that the two communities were drifting far apart. The available material evidence underscores some strong similarities between the elites of both the Samarians and the Judeans, even as other evidence (chiefly literary) suggests that some members of communities advanced competing claims about upholding the heritage of Israel’s ancient institutions. Paradoxically, the recourse to traditional writings, the means to distinguish a particular heritage (e.g. through the reuse of particular names), and the means to honor the deity both groups worshiped (whether at Mt. Gerizim, Jerusalem, or another shrine) were implemented in similar ways. Doing justice to the history of Samaria and Judah entails acknowledging this paradox in the history of Samarian–Judean relations.